* Sometimes junk advertising mail has small pictures that work well. * The thumbnail print sheet that come with your photo print order is a great spot to get tiny pictures that are personally yours. Plus they're picture quality and dollhouse sized! * Calendar covers or backs often have thumbnail pictures that are excellent. * For personal use you can print pictures from the web (make sure copyrights aren't an issue). 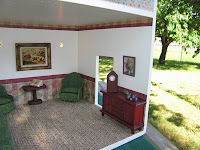 * Sites like Jim's Dollhouse Pages have doll house scale posters and pictures you can print. * Pasting a picture onto craft foam paper works well... choose a color of craft foam that matches the room. If the picture has a frame already printed around it, cut the craft foam even with the edge of the frame. If the picture has no frame around it, you can give any picture a framed / matted look by pasting the picture in the center of a piece of craft foam that is slightly larger than the picture. * Paste the picture straight on the wall, depending on the type of glue you use, this can be permanent. Rubber cement can be used, but it damages some surfaces. * Small pieces of self-adhesive Velcro work well if you think the dollhouse recipient might like to switch pictures around for fun! Make sure you stick the Velcro at the same height throughout your house, then make sure the Velcro on the picture backs is stuck in the center. Then they can be switched around easily. * There is some gum-like tacky stuff you can buy at the store for hanging posters etc. This can be used in dollhouses, but use it carefully. I have a dollhouse that has had it in it for over 10 years now, and it does leave a bit of a "grease" mark and peels off the paint or paper some. Personally, I don't plan on using it again, but it's an option. * According to an interior designer we know, the general rule of thumb is to hang pictures at eye level. For dollhouse scale, this would mean making sure the center of a picture is approximately 5 inches to 5.5 inches from the floor. Of course you have to take the room into consideration and adjust accordingly - if you have less than an 8 inch ceiling height, you'll want to hang the pictures a bit lower so it looks right. Here is a living room showing some picture placements. 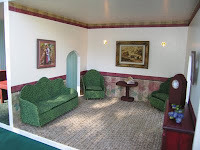 The picture above the sofa is from the back of a calendar, the picture above the inn table is from a magazine's Wells Fargo advertisement, and the picture above the hutch is from Jim's Dollhouse Pages. The pictures are hung using the Velcro method mentioned above.